It’s easy to look at something with cloth walls and a thatched roof and think, “yup, seems fragile.” But when I turn the lens on myself and look at the walls that make up my own life, I just don’t see it. They seem pretty solid. Here’s the truth: I live in a nice apartment, I’m employed, I’m healthy, and I have access to plenty of food. When I go to sleep tonight, I expect all of those things to be true when I wake up tomorrow. But what if I’m wrong? And I was wrong. Recently. Because two months ago, I had an accident while hiking. …or I guess it was an accident? I don’t really know what to call the sequence of events that upended my life for two weeks – a freak occurrence? A weird illness? That time I thought my leg was going to fall off? I have no idea that I’m about to have a really, really bad day. Before anything bad happened, I was slogging through a tough hike. I was in Shenandoah trying for the second time to complete the White Oak Canyon/Cedar Run circuit trail. 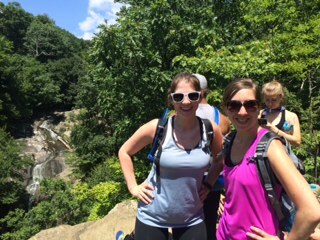 Earlier in the summer, Sireen and I thought this would be a great hike to try without our more experienced hiking friends. It was a poor choice. We got lost. We encountered snakes. We were defeated by steepness. It was ugly. For our second attempt, we dragged my roommate, Kim, with us for the ride. White Oak was a steep as we remembered, but we were much better prepared this time and made it to the top. After appreciating the awesome views, we trudged through what felt like a never-ending fire road, and then (finally!) we successfully made the transition to Cedar Run Trail. We were almost five hours into the hike, and we were all at our limit. I was in the front because I love being the first to see everything. I remember thinking how great it felt to be going downhill. The next thing I knew was pain. My body recognized that it was hurt before I really understood what happened. Sireen and Kim saw me jump and knew something was wrong but had no idea what. After I had my bearings back, we checked out my leg (the site of all the pain) and found a red, slightly swelling mark mid-shin. I’d been stung. I didn’t really see what stung me. I think I saw something black, and there wasn’t a stinger in the wound, so I know it wasn’t a bee. I’ve kind of theorized that it was a wasp, but who knows? Considering how cautious I tend to be, there’s no excuse for what I’m about to write: none of us had first aid supplies. In retrospect, this was a huge rookie mistake. There’s no way to know what’s going to happen when you head out to climb a mountain. 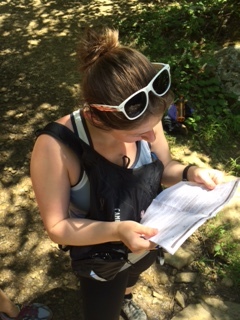 Even experienced hikers get hurt, so first aid supplies are a must! But we were fools, so the only thing we had was some hand sanitizer, which I splashed over the sting. We kept walking. The pain was surprisingly sharp, but I had to keep going, going, going or I’d never make it to the car, never get off my feet and back to civilization. There was a ranger station at the trailhead, and we had big plans to ask them for some first aid supplies and general info about local stinging insects. When we exited the trail, the station was closed. We noticed an emergency phone but decided against using it. The pain had faded to a dull throb, I was fine. No reason to make a big deal out of nothing. When I finally got back to my apartment, I barely noticed the sting. It hurt a little and it was red, but I’d had worse. I cleaned it again and iced it to keep the swelling down. The next day, I noticed that it hurt a little more. Since it was Sunday, I opted to stay off my feet as much as possible and continued to ice the area throughout the day. By the time I went to bed, it was looking pretty good, and I didn’t see any reason to worry. made my way to work. I was only at my desk for a few minutes when I decided to look at the wound again. I was kind of surprised by what I saw. In the hour since I’d left home, the site of the sting had become larger, redder, and a little puffy. I theorized that my pants had irritated it or that I was having a bizarre delayed allergic reaction (in case you’re wondering, that’s not possible). I had a nagging feeling that something was off, even if I didn’t want to admit it, so I asked my group chat friends their opinion. The consensus was that I was probably fine, but should maybe see a doctor, so I decided I’d make a trip to urgent care after work. As the day progressed, I tried but couldn’t stop thinking about the sting. I thought I was imagining it, but it kind of seemed like it was getting worse. At lunch, I showed it to my coworkers to get a second set of opinions on my situation. They also seemed concerned and wanted me to see a doctor, but I still thought I could wait until after work. I went back to doing my job, but I was feeling more and more agitated as time passed. After about an hour, I headed into the bathroom to look at it again. It was noticeably worse. It was redder, bigger, growing, and it had become hot, frighteningly hot. Telling your supervisor that you’re having a medical emergency is strange. The situation wasn’t helped by the fact that I was in denial. I could see that I had a steadily growing health crisis, but I couldn’t comprehend that any of this was actually happening. Even as I went through the motions of surveying people and leaving work, I thought I was being ridiculous. I really believed that I was going to go to the doctor and they were going to laugh at me for blowing everything out of proportion. I left the office, and I felt enough urgency that I didn’t want to take the time to want to wait for an Uber, so I started walking up to the main road to hail a cab. Halfway there, my leg stopped cooperating. Every step sent this strange jostling pain up my leg. It hurt. It was a “stole my breath away” hurt, and a “made me want to give up and sit on the ground and cry a little” hurt. So I stopped moving and ordered an Uber. I made it to the urgent care center a little after 2:00 pm. In that short time, it seemed like the wound had somehow become even larger and more inflamed. I was only seven hours into my day and what had started as something that I thought wasn’t a big deal was literally spreading all over my leg. I was called into the back pretty quickly. While with the nurse, I explained the whole story and finished with, “but I’m probably overreacting.” To prove my point, I rolled up my pant leg to show her. She kind of frowned as she looked at it and said, “that’s not an allergic reaction.” She didn’t explain further (probably because she wasn’t a doctor), but it didn’t matter. My heart sank. I really, really thought I was being ridiculous, but that was the moment when I started to think that maybe I was in the middle of something serious. I sat alone waiting for the doctor for a while. My leg was splayed out on the examining table mocking me. There was nothing to do but stare at my wound and hate it and all of the changes it had undergone in the last few hours. 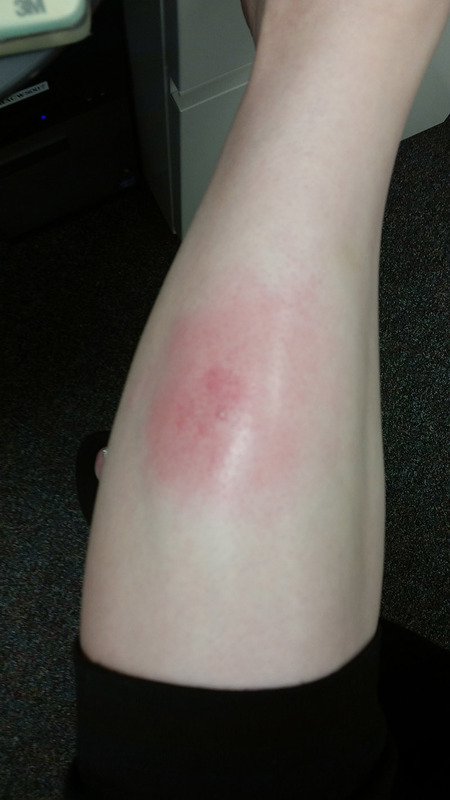 There were now weird red lines radiating from the epicenter of the sting, the center of the wound had become a raised white dot, and the pale red surrounding the sting site had spread to cover almost my entire shin. The doctor came in, took one look at me, and told me I had an infection. He continued to examine it and then announced that I had staph/MRSA (yes, he said both, it was confusing). I’m kind of a news junkie. I’ve done my fair share of reading about improperly clean hospitals filled with uncontrollable MRSA outbreaks. That’s what I think of when I think of staph. I don’t think of wasp stings – of teeny tiny nothing wounds – morphing into uncontrolled runaway infections. The instructions I received were scary. 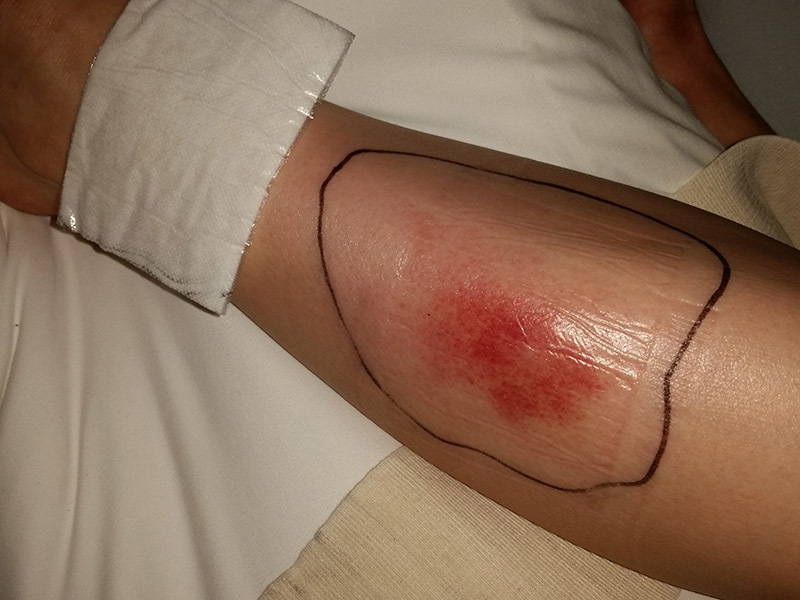 The nurse drew a thick, dark line around the edges of the wound. I was told that I needed to take the antibiotics I was prescribed immediately (this was repeated at least four times). If the wound grew or if it got to my ankle or knee, I needed to go to an emergency room immediately (I can’t even tell you how many times they repeated this). I needed to watch the infection because it could start to shrink and then flare up again. I was told to return in two days for them to check that it was healing and possibly lance the wound. Ew. The nurse wrapped my leg from just above my ankle to just below my knee. It kind of looked badass. I got a lot of stares. If you can believe it, this was taken after I was getting better. I was prescribed two types of strong antibiotics, and they quickly went to work combatting the infection. Within a day, I could see the red spread of the wound recede and it hurt less. After spending a feverish day Googling and panicking over a possible emergency room visit, this improvement felt like a miracle. I wish that was the end of the story, but antibiotics have side effects, and these hit me hard. I felt so sick, more ill than I ever felt from the infection. I wanted to stop taking them, but the meds were standing between me and a horrible infection relapse, so it wasn’t really a choice. Two months later, my stomach is the only thing that hasn’t fully recovered. Antibiotics are amazing, but they stripped my body’s ecosystem raw, and I have no idea when it will return to normal. Despite the side effects, I can’t help but pause and appreciate how lucky I am to live in this time and place, and to be in a country where we have good doctors and access to a whole host of powerful medications. I just came back from Cuba, where basic medicines and antibiotics are not as accessible. Since the staph incident was still fresh in my mind, I spent a lot of time wondering – what happens to people who contract serious infections in this country? Amputations? Death? Even in the U.S., people die from staph infections. For me, this was a pretty terrible ordeal. It shook what I thought were the sturdy foundations of my life and, like all scary events, it inspired a lot of introspection about what is and isn’t important. This past year, far too many people connected to me and the people I care about have experienced life-changing illnesses. Seeing how they’ve been affected…it’s hard. So let’s put this in perspective – my brief illness doesn’t rate. If my life were a book, “that time I got staph” would barely get a paragraph in what I hope is a long, long novel. But it was a startling reminder that the structures that make up my life are fragile. A few days after everything happened, I received a card from my mom. It started with, “I hope you are feeling better and will continue to hike.” Since I was still being introspective, reading those words made me pause for a moment and think. Hiking was indirectly responsible for everything that happened to me. If I’d never gone out on the trail that day, I never would have had the unfortunate run in with the wasp, and staph would still be a thing that happens to other people. When your walls shake and fall down, the easiest action is to blame the thing that’s responsible, resolve to avoid it, and rebuild your walls. You can build them and you can build them, but if you’re not careful, you can build those walls so thick that you stop experiencing life. I’m ready to go back on the trail! Blaming hiking, deciding to stop, would be easy, and honestly, if I keep hiking, there’s a good chance that someday I could really hurt myself. It would be simple to decide that the potential for injury – even if this entire thing was the result of a freak series of events – is too great to keep going. But I think this experience taught me that my foundations are too strong to just give up. So at least until the next traumatic event takes me down, I’m going back on the trail.